I sleep in until 8AM, get dressed and go to the dining room for breakfast. I have a cappuccino with some pastries, fruit, and a spoonful of scrambled eggs. The ship arrives in Port Antonio on schedule at 10AM. There’s a pretty serious crunch as the ship makes contact with the concrete pier in the stern. The crew make some repairs while we’re docked. I find this sailing ship is a photographer’s dream if you look up at the fantastic rigging and sails, and it is also a nightmare, because there are lines and masts everywhere obstructing clear views overboard! I am on the shore excursion Highlights of Port Antonio. First stop in our minibus is to view Trident Castle, a German-built modern castle located on a beautiful cove, which mainly caters to weddings. We don’t go into the castle, but instead carry on to the Jamaica Palace Hotel, which is our first stop. 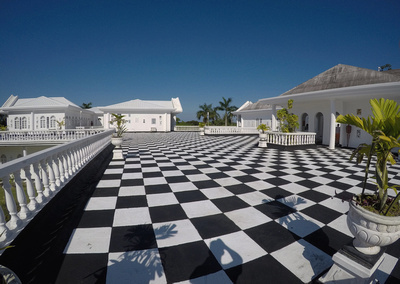 It is a very striking hotel, and has surprisingly reasonable room rates starting at US$120/night. We are given a Rum Punch welcome drink, and a tour of the extensive grounds including their art gallery. Along the way, we learn about the resident crocodiles in Springs area, and how the national fruit Aki opens naturally and is eaten with salt fish (the national dish). We make a stop at the Blue Lagoon, which I find underwhelming. 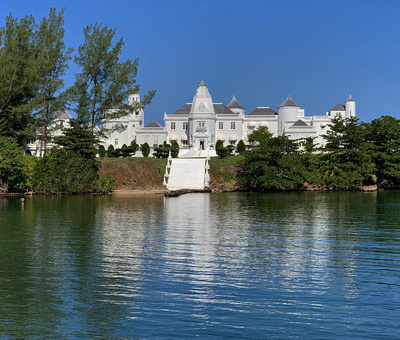 Trident Castle, Jamaica Palace Hotel, and Blue Lagoon are all touted as being used as locations for movies. Our last stop is Frenchman’s Cove, where there is a private beach for us to lounge on and swim from. There is a freshwater stream beside the beach flowing into a saltwater cove – both of which are very pretty. 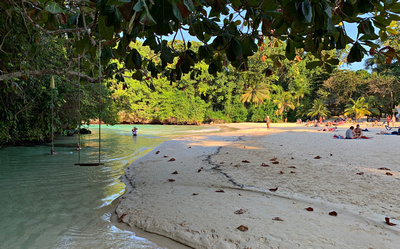 Unfortunately, the water in both is quite cold, so I don’t bother trying to swim or snorkel, instead preferring to sit on the beach in the shade of a palm tree. The beach is not crowded, and we have a couple of hours here to enjoy ourselves before returning to the ship. All 44 sails are set as we leave Port Antonio and then they are taken down again once the Sun sets and the ship is underway. Being a square-rigged sailing ship, the Royal Clipper needs a following wind to actually proceed under sail. The southeast winds we are encountering are virtually on the nose of the ship, hence the reason for the sails being taken down when the ship is underway, although the stay sails are often left up to improve the ship’s stability. At dinner this evening, I’m seated with a Texan couple who are both real characters. She submitted a request for one of the desserts appearing on the menu this evening – Floating Island with prune. I ordered it, and found is was pretty nice – thin custard on the bottom, merengue, and a dollop of pureed prune. After driving down the steep roads from Jebel Shams, we visit the beehive tombs at Al Ayn.These tombs are about 5,000 years old, although not much is known about them. This means the necropolises were built in the same era as the Egyptian pyramids. The tombs are fascinating and quite photogenic, however as we descend from the ridge to return to our 4x4s, the wind picks up and a sand storm blasts everyone as we hurry to get back inside our vehicles. Next stop is Jabrin Castle, which was built by the Yaruba dynasty Imam Bil’arab bin Sultan, who ruled from 1679 to 1692. 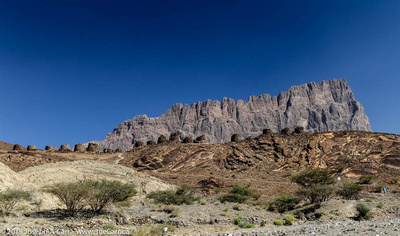 This is without a doubt the most impressive castle or fortification we have visited in Oman. It is a UNESCO World Heritage Site, is beautifully restored, and is surrounded by groves of palm trees in a lush valley. The castle has impressive wooden painted ceilings in some rooms. After driving back along the highway to Muscat, we say goodbye to our driver Ali, who drops us off at our hotel, the City Seasons Hotel. He has been an excellent driver; taking us over sand dunes at Sharqiya Sands, along back roads to Bedouin camps, and zooming up and down expressways and mountain roads. It has been a wonderful driving adventure in our 4x4s over the last five days. 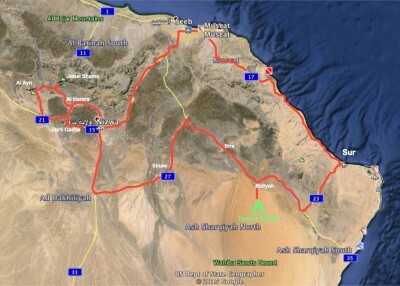 Tomorrow, we drive from Muscat back to Dubai (in a bus) for our final day in Arabia before returning home. After driving from Muscat to Desert Nights Camp, we quickly get settled and then go out on a dune ride to see the sun set over the sand dunes. We drive out of the desert camp and take the highway to Ibra, where we wander around the Wednesday Woman’s Souq being held in Ibra. On the way back, we see the 400 year old town and fortifications of al-Mudayrib, where the buildings are made out of mud. We travel across the dunes once again to a Bedouin camp, where we see some of their handicrafts (some people buy), and have a traditional lunch under the shade inside their reed houses. A couple of our group have a ride on a camel. It’s very hot by this time, so we are all glad to climb back into our air-conditioned vehicles for the ride back to our air conditioned rooms and nice showers at our luxurious desert camp! Our tour leader Michele organizes a group photo in front of the sand dunes late this afternoon. We manage to find a camel to stand behind, and it behaves itself very nicely while we pose in the afternoon heat. I opt out of this evening’s 4×4 drive to the sand dunes at sunset, since I need some down time. 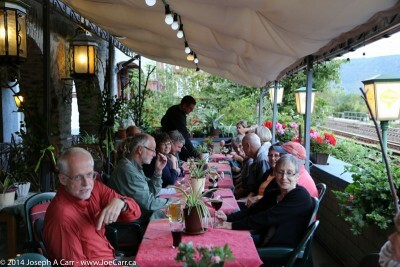 We spend two nights in Routte, Austria at the Alpenhotel Ernberg hotel, but don’t see much of the country. Some of our group hike up to Ehrenberg Castle ruins, which are on top a hill near our hotel. 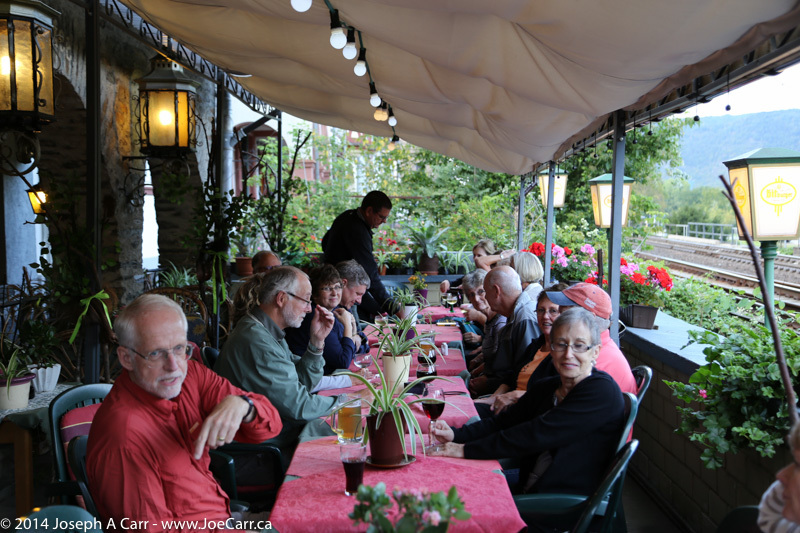 We have our own dining room for the group dinner in the hotel each evening. Jennifer is a chef, and so is always on the lookout for regional food treats to share with the group. After one of our dinners, she serves Apple and Cheese Strudel for dessert. We drive back into Germany on Saturday the 6th to see the Bavarian Castles. We are listening to the Sound of Music on the bus audio system as we drive through the Austrian Tyrol on our way to Italy. The first hour reminds me of our mountain highways in British Columbia, Canada – winding, rocky, and steep hills. We descend into a long valley and take the Autobahn to the outskirts of Innsbruck. We turn south and drive over the Brenner Pass, crossing the Alps into Italy. Border crossings in Europe are non-events, since all the countries except Switzerland and Sweden are in the European Union. Jennifer tells us we are following the original Roman road Via Claudia the whole way today. That road ends up in Rome, although our next stop is Venice. We drive back into Germany from our Austrian hotel this morning to see two famous Bavarian castles both near Füssen in Bavaria. 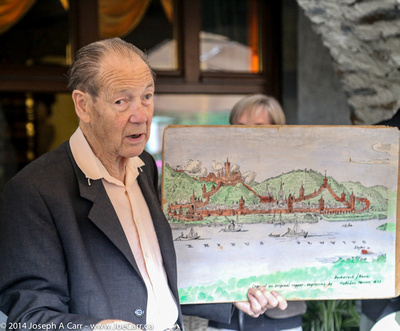 King Ludwig II’s Neuschwahstein Castle is probably the most famous, since Disney’s Fantasyland castles are modeled after this spectacular castle located on a hillside overlooking a beautiful green valley and lake. The crowds here are very bad, especially on Mary’s Bridge, which is above the castle, giving a picture postcard view of the castle with the valley behind. This castle was built in the 1800s, and poor Ludwig only got to enjoy his castle for a few months before he died. When Ludwig was king, his ministers plotted to depose him in 1866 because he was homosexual. He committed suicide in the nearby lake along with his doctor (who had just declared him mad – later disproved). Heohen-Schwangau Castle is a beautiful castle located beside The Alpsee, a glacial lake. This is where Ludwig’s parents lived, and is where he was raised. His father, the king loved the night sky, and had his bedroom equipped with stars in the ceiling and a Moon, which could have the phase changed as required. Jennifer and Sylvain have a picnic lunch all ready for us when we return to the parking lot, so we spread out near the Alpsee lake and enjoy ourselves. After getting clear of Neuschwahstein Castle, we take a group photo in the nearby valley, posing with the castle behind us on the hill. 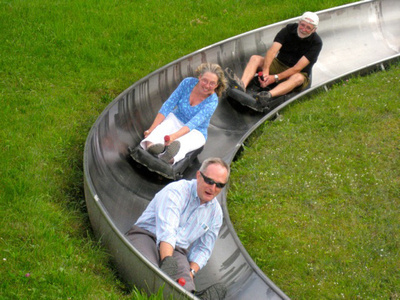 Next stop is a luge – individual carts run through a metal tube down the hill, slalom-style. Everyone in the group tries it – some go faster, and others take is slowly. The luge is one of the reasons I finally decided to book this Rick Steves tour. I reasoned that any tour operator who includes a ride on a luge as part of the stated itinerary must have something going for them! After breakfast in our hotel in Bacharach, we schlep our bags across the street to where the bus is parked. Our bus really hustles along the German Autobahn, passing the ultra-modern Frankfurt airport before arriving at our morning rest stop. 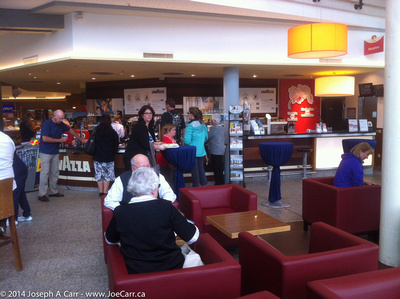 This rest area facility is very deluxe: a nice gift shop with high end stuff for sale, German pastries, Lavazza coffee bar, deli smorgasbord, and wonderful toilets and showers! There is a 0.70 Euro charge to use the toilets, but they give back a 0.50 Euro coupon for merchandise purchases. There is even an adjacent, small hotel for overnight rest stops. Our bus driver tells me he has used the hotel on winter ski trips, and says the rooms are very nice, and quite inexpensive. We arrive at Rothenburg ob der Tauber around noon, and after some lunch on our own, Jennifer walks us through the main street to familiarize us with this medieval city. It is obviously what Disney uses to pattern their Fantasyland theme parks after. 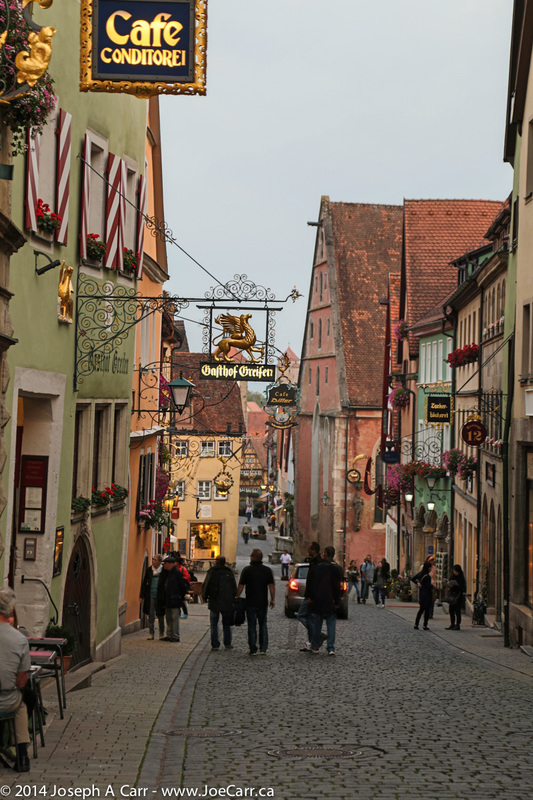 Rothenburg has an impressive wall, towers and gates around the old city, cobblestone streets, quaint shops with eclectic merchandise, and beautiful vistas of the valley below. As I wander the streets, there is much to see and experience: German confections in a bakery window; castle gates; giant bird’s nests on rooftops; clock towers; churches with flying buttresses; pretty half-timbered houses; endless window boxes sporting Geraniums and other flowers; cobblestone streets; ornate metal signs above all the businesses; huge numbers of hotels, drinking and eating establishments; Christmas shops and other specialty shops. Then there is the Medieval Kriminal Museum, which I decide to visit. It is filled with masks of shame, executioners costumes, racks and torture chairs, bludgeons, and describes medieval justice in great detail (not all of it gory). The Meistertrunk town clock is very special, since two mechanical figures appear out of two doors beside the clock face once in awhile, and do an elaborate ritual before retreating back inside. I would say, there is something for everyone in Rothenburg. The city is jammed with day-trippers during the afternoon, however by evening they all leave on the buses they came in, and the streets return to normal. Some of us go to a Greek restaurant across the street from our hotel for dinner. I then grab my camera and take advantage of the beautiful pastel-coloured light as the Sun is setting. The whole city looks magical as I walk along a section of the city wall during “the golden hour”. Later, I meet up with the tour group in the main square at dusk. 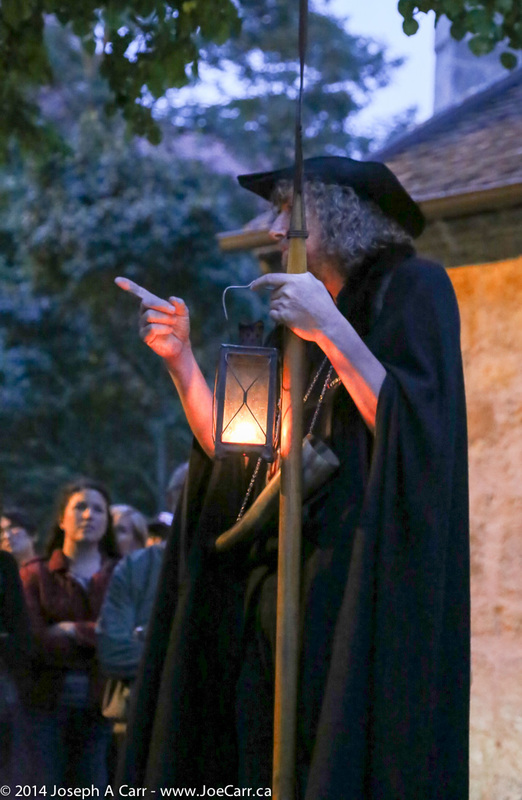 We follow the Night Watchman, which is a guy in medieval costume carrying a scepter and lantern. He delivers a humorous historical talk as we wander from place to place through the city. He explains the function of the night watchmen in medieval times: ensuring doors are locked and people are not on the streets as night falls. He describes the city gate system, and how people had to make their way inside the security of the walled city an hour before dark. He does two walks/talks – one in English and one in German. 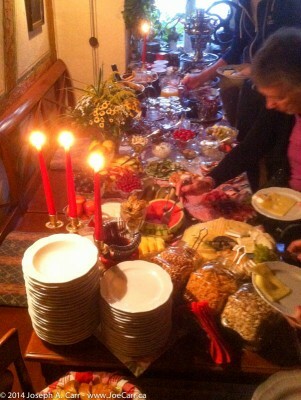 The breakfast buffet at Hotel Gerberhaus this morning is very impressive and quite delicious. The coffee is also the best we have had on the trip so far, despite it being filter coffee. There are all sorts of cheeses, cold meat, pastries, fruit, cereal, and sweets, including chocolate! We then schlepp our bags out the back door, down the alley and through the doorway in the city wall to our bus waiting for us in the parking lot.